What Is DISH Anywhere & How Does It Work? Television technology has its goods and bads. While it has advanced a tremendous amount since the old TVs and antennas, there are still some problems that we have to face. We sometimes lose our remote, our wifi that connects to our TV cannot connect, and there are always the annoying commercials that we encounter. One of the hardest problems is the fact that you can’t watch live TV anywhere. There are those annoying problems that we all have to deal with and then there are those few companies that are seeking to solve those problems. DISH Network is one of those companies that is seeking to provide you, the customer, a solution that will rid you of some annoying and persistent issues. Dish Network is an American direct-broadcast satellite service provider. The company provides satellite television, audio programming, and interactive television services to commercial and residential customers in the United States. DISH Network has been under some scrutiny lately. They have been losing a number of subscribers due to the fact that a lot of their products cater towards older generations that have not adopted the latest technologies. With most of their customers are fine with older technologies that still provide service, but they are neglecting a large target customer. The younger generation is becoming a larger percentage of the greater generation. In addition, they are consuming more content through channels like Netflix, Amazon, and Hulu. With this being such a critical time in the market, DISH has needed to step up to the plate and offer a product for this market. So, have they actually done this? Is this product worth the younger generation looking into? The list of questions can go on, but it all comes down to the reviews and the actual experience. The best part? They did end up stepping up to the plate and here is what they produced. Let me introduce you to a great solution that fits the gap mentioned above. DISH Network is offering DISH Anywhere. This product allows you to watch thousands of movies and shows instantly, on any platform that you want. Whether you are traveling the world, commuting to work, or relaxing at home, you now have a chance to watch your favorite shows. 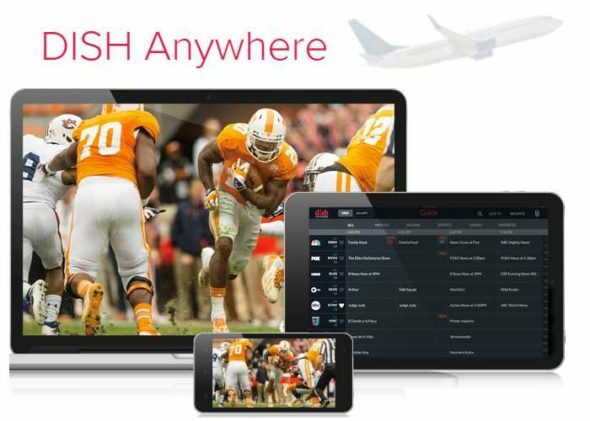 DISH Network has developed a great app for your iPhone, Android phone, Kindle, iPad, computer, and TV. The user interface is simple and intuitive, allowing the customer to guide through the app without any stress or struggle. What is included in DISH Anywhere? While Netflix and Amazon are great for recorded content, it does not provide the option to watch live TV. While it is great to watch those great premiers or news the next day (can you sense a little bit of sarcasm? ), there are definitely times where live TV comes in hand. No more having to wait till the next day for it to be released. Watch it live and enjoy the moment! When you are not able to watch that live show, record it with a few simple pushes of the button. Watch those recordings whenever they work for you and enjoy being able to fast-forward through commercials, boring scenes, or even rewind to catch that perfect moment again. There are three types of watching for people; live, recorded, and on-demand. Have you ever wanted to watch a UFC fight or a different type of show that was only featured on-demand? While you wanted to watch it, you did not have the capability to do so. Well, now you have an option that allows you to watch that fight or show. Needing to leave the home, but do not want to wait until you can get back home? Transfer select DVR recordings from your broadband-connected Hopper with Sling to a tablet device with the DISH Anywhere app installed. We have all been there – when our favorite game is on but we are not able to watch it cause we are away from home. Not anymore. Check the latest scores for all your games, find channel listings, set your favorite teams and tune to games anywhere. Browse through your program guide, filter content and set recordings on your broadband-connected, Sling-enabled DVR. Plus utilize integrated remote functionality to change the channel, volume, and more! With all these added benefits, would more could you want? This covers the gamut with the options and allows you to watch it literally anywhere, anytime, and any channel. When you read the above, you might notice the word “Sling”. What exactly is Sling and how does that tie into DISH Anywhere? Starting at $20 a month, you can now access hundreds of channels that you have always wanted. The fact that DISH network and Sling partnered together to provide this shows how DISH is making leaps and bounds to market towards the younger generations. Still not sold? Here are 2 final reasons why you should buy this product. Sling on the move – Most younger people already have Sling TV. It’s a great product that allows you to watch TV, but not pay a lot of money on a monthly basis. Since you already have the Sling (assuming you do – if not, you should get it), why not take it anywhere you want and watch it on the go? DISH Anywhere’s Features – From the website, you will be able to see that there are some great features that are available such as, Game of Thrones, Martian, Bad Moms, and Colony. These are only the current features and they will continue to update to provide you with great content. So, now that you have been exposed to the tremendous world of DISH Network, you no longer have to wait to watch live TV, can manage your DVR from a distance, and easily pick up watching any show from literally any device that you have. DISH Network has made it easy for you to get instant access to your favorite shows and movies, with just a click of the button. No longer be restricted to watching shows or movies at only your house, the world is now your oyster. I’ve always grown up with free public TV, so I wasn’t sure what dish was. I like that Dish network can record shows, so you can watch them later if you are busy. My uncle is a big sports fan, so this sounds like it may be a great thing for him to try. I’ll be certain to share this with him.